Ki Tavo: creating our own narrative by our own actions. What we do becomes what we are. The commandment at the beginning of the sidra is familiar to us, reminding us to tell our story in such a way that we do not just focus on harvest, or on our good fortune, nor even to tell it while recognising that our good fortune is not simply the result of our own effort, but to create a narrative that puts our experience into the context of the historical experience of the Jewish people. Telling our story is how all of us make sense of our lives. Each of us has a narrative running through our consciousness, each of us notices most easily what fits into that narrative, manages to ignore that which cannot be meshed into the story. The theme of these days of preparation for Rosh Hashanah – that of opening and reading to book of our lives, emerges in part from the awareness of the stories we construct about our everyday experience. But while each of us may be the centre of our own continuous narrative, Jewish teaching does not allow us to become self-absorbed. Instead we are expected to see ourselves as part of a whole that is greater than ourselves. We are part of a people. We live beyond this moment – we live in the span of the whole experience of our people. And the way we express ourselves religiously is woven into our internal and external narrative. We have to become aware not only of the immanent God with whom we can create some form of relationship of “I – Thou”; The God we worship is the God of history, the God who has no limits of time or space. Ever since we accepted Torah, Jews have been taught to see God at work in the world around us, in the historical experience of our people, and in the humanity of others. Each of us, like the Israelite farmer bringing his first fruits, is required to tell a story, to render an account – before God and to our innermost selves, of who and what we are – a narrative that explains just what it is that spurs us on to action in this world. In telling his story, that farmer was commanded to look beyond his immediate reality to a vision of what his life was to be about. So, we too, are asked, when telling our story, not to ignore the “real world” but to transcend it, to direct our attention away from the concrete trivialities of our material existence and toward those goals, however exalted and “unrealistic,” that God would have us set for our lives. The ger, (Sojourner/stranger) is almost a synonym for the idea of the vulnerable, the one who does not have land or resource, the one without the support of family or landsmen, the person who is quintessentially alone. Today the closest equivalent is likely to be the refugee or the asylum seeker, washed up without possessions in a foreign environment. Torah requires us not only to acknowledge our own good fortune, but to behave directly out of that acknowledging, to routinely share with those who do not have the same good fortune as us. The act of thanksgiving commanded at the beginning of the sidra leads us to act even before thinking about the action, getting us to do a good thing, to perform a mitzvah, that will shape our understanding of the world, that will shape us. The requirement to care for the vulnerable enters into the narrative we live by each day, we cannot disregard it. It is no surprise therefore that tradition teaches that “In the future age, all sacrifices and prayers will be abolished, except that of thanksgiving”. 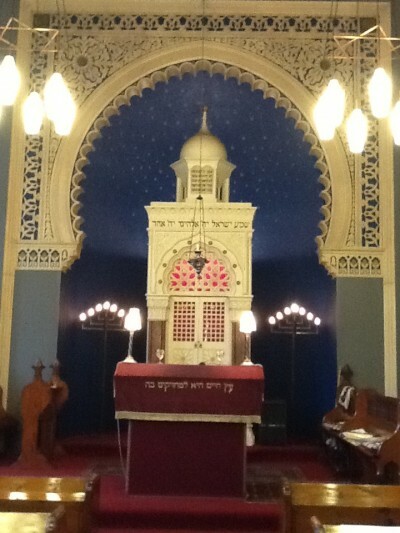 (Menachem of Gallia, in Vayikra Rabbah 9:7). In this month of Elul as we approach the High Holy Days and we think about what we have done and what we have not done, what we should do and what we fear we will never do, it is important to remember that these days are the white fast, they are days of Awe but they are also days of thanksgiving for all we have, for knowing that God will not desert us, that God will let us find our way if we search. They remind us that we should not forget our past nor think only of our present. They remind us that we have to find the words to tell the story that is true for us, that gives meaning and shape to our lives. And even before we really understand, we have to act.